John Deere is a name recognized instantly anywhere in the world. This is a great testament to the quality and endurance of the machines made by this American company over the past decades. Hey continue to make outstanding products for the homeowner and commercial customers alike. John Deere provides a service that few other ZTR mower manufacturers copy - they allow customers to compare their ZTR mowers to the competition, for a feature by feature comparison. It takes great confidence in your product to invite this level of scrutiny. All the John Deere ZTR mowers feature the ‘3 in 1’ option,allowing for side discharge, mulch, or rear bagging. The deck cutting height is adjusted manually using a lever, or with a foot control on the more expensive models. The blades are engaged with an electric PTO on all models. The front axles on the entire John Deere ZTR line is pivoting fabricated steel. This is standard on most homeowner ZTR mowers. The frames on all the John Deere ZTR models is fully welded tubular steel ( no bolts and nuts to come loose, compromising the frame strength). The tubular steel frame is a premium feature, which gives added strength and stability. John Deere ZTR mowers are available in 5 models - the Z225; Z245; Z425; Z445; and Z465. As the model numbers increase, the mowers become more expensive, and are equipped with heavy duty engines and more sturdy transmissions. Starting with model Z425, the Kanzaki DUP-10 pumps and Parker wheel motors become a standard feature. 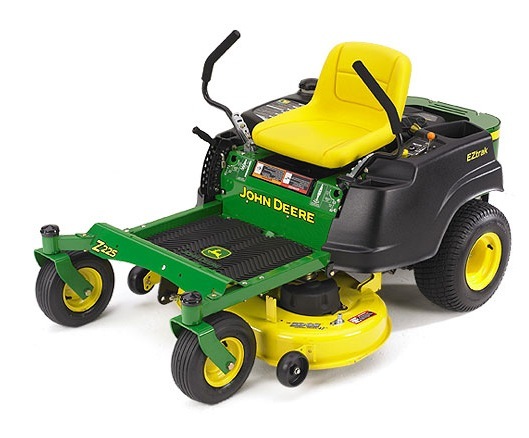 Model Z225 is the lowest priced John Deere ZTR offered. The 18.5 HP single cylinder overhead valve (OHV) Briggs and Stratton engine drives the Hydro-Gear EZT transmission units at each wheel. The engine features a pressurized oil system, with a replaceable oil filter, just like it’s twin cylinder cousins. The lap bars controlling speed and direction are padded and fully adjustable. The cutting deck 42” in width, with a stamped steel deck. A medium-back adjustable seat without arm rests keeps you comfortable while the grass is flying. Cutting deck height is adjusted using a hand lever. The cost of this entry level machine with some very good features is about $ 3000.00. Model Z245 is the next in line. The engine has been upgraded to a more powerful 23 HP twin Cylinder overhead valve ( OHV) engine, which delivers substantially more power that the single cylinder engine. Reliable Hydro-Gear EZT transmission units at each wheel round out the drive system. The engine features a pressurized oil system, with a replaceable oil filter. The lap bars controlling speed and direction are padded and fully adjustable. Adjustable lap bars are rare in homeowner ZTR mowers, and can make a big difference in the fatigue level at the end of a job. The cutting deck 48” in width, with a stamped steel deck shielding the 3 cutting blades. The medium-back adjustable seat comes equipped with arm rests, which can help tremendously. Who needs sore shoulders after mowing the lawn? Cutting deck height is adjusted using a hand lever. The cost of this better than average homeowner ZTR is about $ 4000.00. Model Z425 is the start of the models with more commercial ZTR features. The 23 HP twin Cylinder overhead valve ( OHV) Briggs and Stratton engine is paired with dual Kanzaki pumps and Parker wheel motors - just like the pros. Lap bars controlling speed and direction are padded and fully adjustable. The seat is adjustable with standard arm rests. The cutting deck is a generous 54” in width, helping to make short work of even the largest spread. The cutting deck is stamped steel. Cutting deck height is adjusted using a hand lever. The cost of this ZTR with some commercial features is about $ 4100.00. Model Z445 comes with either a 48” or 54” cutting deck. In either case, the engine has been upgraded to a Kawasaki 25 HP twin cylinder overhead valve (OHV)engine with pressurized oil system and replaceable filter. Dual Kanzaki pumps and Parker wheel motors come standard - can you just imagine that smooth power at your fingertips as you zip past your landscaping? Lap bars controlling speed and direction are padded and fully adjustable, of course. The seat has an 18” back with arm rests, and is adjustable. Cutting deck height is adjusted using a hand lever. The cost of this beauty is about $ 4900.00. Now for the top of the John Deere ZR mower mountain. The King of the hill is model Z465. Powered by the Kawasaki 25 HP twin cylinder overhead valve (OHV)engine with pressurized oil system and replaceable filter and dual Kanzaki pumps and Parker wheel motors, this baby is ready for anything the homeowner can throw at it. Cutting deck width is 62”, making it the fastest lawn eliminator in the ZTR line from John Deere. An optional foot assisted lever helps making those height adjustments a breeze. Lap bars controlling speed and direction are padded and fully adjustable, as always. The seat has an 18” back with arm rests, and is also adjustable. The cost of this dream machine is about $ 5700.00. John Deere ZTR mowers are well engineered and built. They offer excellent quality for the price, and the company stands behind the products they sell through dedicated dealers that have been around for decades.